Whether it be studying abroad or planning a trip to the beautiful country of Italy, it can be difficult to decide when to go; fall or spring? winter? or the dreaded high season of summer? From my experience studying in Florence for a semester in the fall season, I cannot imagine why anyone would want to go at another time. October is a time in Italy where the grape harvest begins. What better time can you imagine to be visiting the country infamous for its wine varietals than when the harvest is in the air and beautiful blends and Super Tuscans of wine are being produced directly from the vineyards that line the hills of the countrysides. This gives you an amazing opportunity to visit vineyards and sometimes even witness the harvesting which makes this country infamous for its wine. Do I need to persuade you more? Yea… I didn’t think so. Learn a little about wine from the expert vintners of Tuscany themselves. Wine and olive oil…the two backbones of Italian food and wine culture that make up 99% of the cooking techniques. Early november happens to be olive harvest season where the olive trees are shed of their olives and pressed into fresh, pure olivey goodness. The first press of this olive oil forms a beautiful, thick green olive oil that tastes unlike anything you have ever tasted. Being in Italy during this cultivation also provides you with the unique opportunity to visit the olive oil mill and even buy or taste the first press extra virgin olive oil. (Aka: Liquid Gold). The harvest is something very important to Italian families and often makes the difference of their livelihood. They pour so much passion into the process and truly make it an art that you have the chance to experience. Depending on where you are in Italy, the seasons can differ slightly but overall make fall a prime time to visit. In Florence, which is considered central/northern Italy in Tuscany, this is the PERFECT time to visit. Tourist season is coming to an end, September is still warm and 80 degrees F, October is a comfortable 70 degrees F, and November and December become a cozy 55-60 degrees making it perfect for the transition to more comfortable fashion. In Florence November and December is when you will see beautiful leather boots emerge from the local shoemaker stores. What better souvenier to go home with than a beautiful Italian made pair of leather boots. I LOVE mine and they have a certain quality that you can hardly find here in the United States. Set aside 200 euros or so for the investment in a pair…they will last you forever and you will receive an endless stream of compliments. Endless cashmere scarves, leather jackets, leather boots, stunning leather gloves, and more… you get the best of the Italian shopping experience during the season change. Take care when shopping for quality products as you will find a lot of fake items sold by people looking to take advantage of ignorant toursits. In Florence, many items in the leather market in the San Lorenzo area and Mercato Nuovo actually are not leather. For quality leather, go outside the city center a little bit and visit small shops with local shop owners. My boots are from the area I lived in which happened to be a big place for the locals. I highly recommend Camilla Store which I will provide the contact information for. Also, the Leather School is a Florentine gem that is hidden behind Santa Croce, housing some of the best made leather products in the entire world. 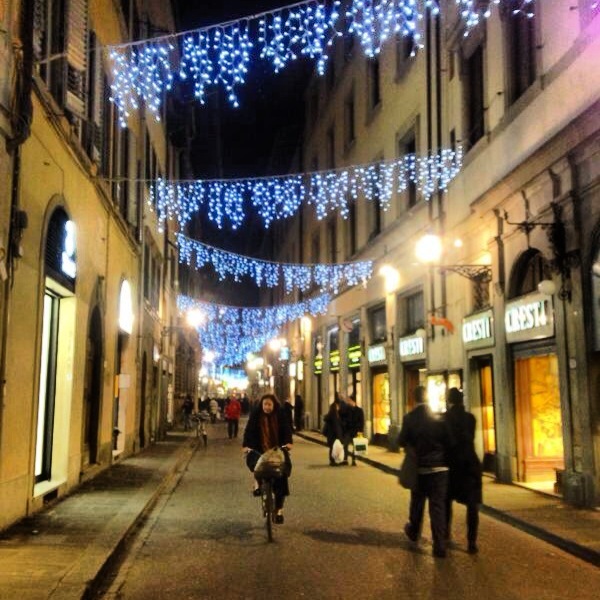 Being in Italy during the holiday season is truly magical, there is no other way to describe it. Italians take such pride in their Roman Catholic faith and have different traditions you will experience throughout the towns and cities. In almost all of the larger cities in Italy, this is when you will see lights drape the streets above your daily walk like chandeliers in a palace hallway. I’m not exagerating…the streets are literally lined across the top with chandeliers and holiday lights of different styles which transforms the city into an even more magical place than it already is. Every city has a different style, as well as every street. 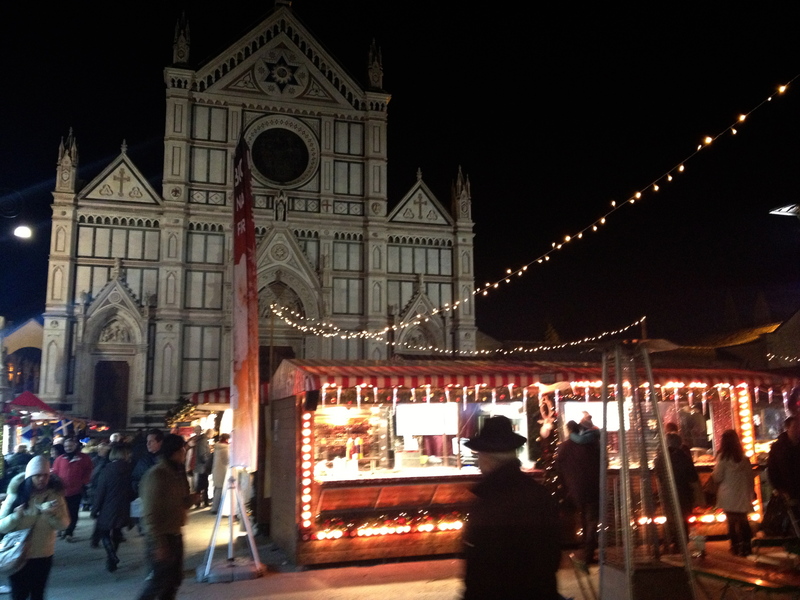 You will also see beautiful Christmas tree lighting ceremonies and nativity scenes displayed in front of the duomo center of each large city (church). 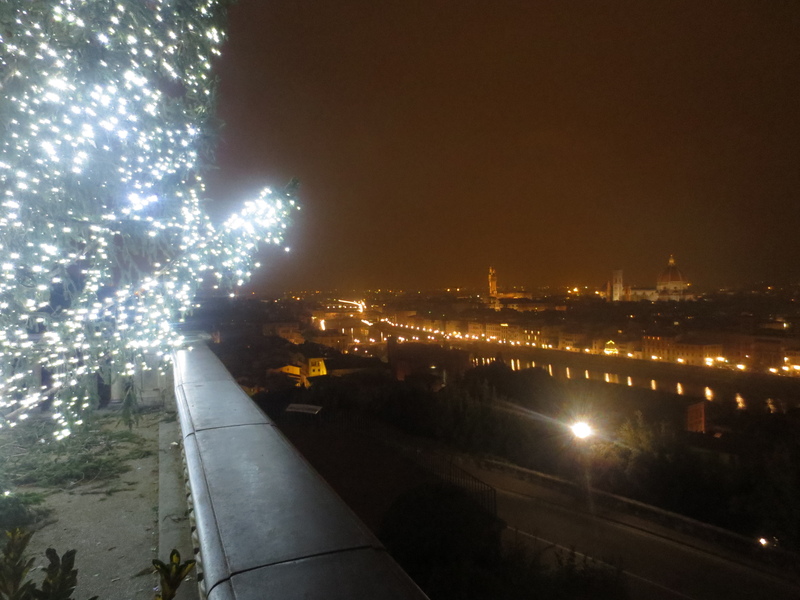 In Florence, they have a magical display in front of the Duomo, or Santa Maria del Fiore, of a beautiful tree decorated in Florentine lily ornaments which lies next to the nativity scene. After the lighting ceremony at the beginning of December, these remain lit until Christmas, making your walk home comforting and stunning. Also, don’t forget to try some local food and drink specialties in this Christmas time. 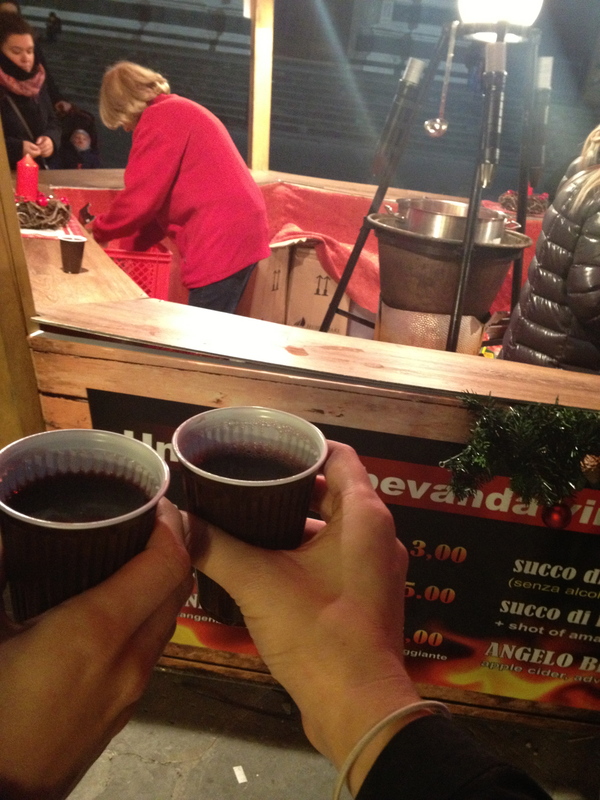 Local chocolate shops will have “cioccolata calda” which is basically hot chocolate…a heavenly version. Italian hot chocolate is basically melted rich chocolate fondue in a cup. Just try it…I shouldn’t need to describe it from there. It is heavenly. Depending on the region you are visiting, you will find different winter foods that will emerge on local trattoria and osteria menus. They will reflect foods that are in season and more comforting and traditional to their culture. In Florence, make sure you try a classic ribolita which is a comforting Tuscan soup. Also, pappa al pomodoro is a thick Italian tomato soup that is made with day old Tuscan bread. You will also begin to see dishes in Tuscany reflect cinghiale which is wild boar, often served in a red sauce with pappardelle pasta. Don’t forget to try some chestnuts! You will find these being roasted by a street vendor in the corners of major piazzas, filling the city streets with the rustic smell of roasted chestnuts. I could go on forever, can you tell I love this season in Italy? In late November, just about the same times the lights go up in the streets you will hear of Christmas Markets. German Christmas markets go up in major cities all around Italy, Germany, France, Belgium, and Austria bringing a true European experience to you. You have the opportunity to try cuisine from these places, traditional desserts, spices, ornaments, handmade wood items, and more. Each Christmas market will be different but all bring a unique experience and a great way to find gifts for those on your Christmas list. I highly suggest trying the different foods at these markets, it is much cheaper than traveling to Germany to try it there! So grab a friend and a cup of hot mulled wine and get a chance to travel around Europe just by walking through the aisles of the local Christmas market. Florence’s is located in Piazza Santa Croce. Calcio (soccer) is very important to Europeans, especially Italians and Spain. You will know that it is the season just by the energy on the streets during games. The season runs late August through May, making fall a prime time of excitement for the beginning of the season. The energy at the stadiums is unreal, they truly have so much passion for the sport. You will hear similar chants to American sports, however they usually do them in song rather than just yelling words. Tickets are usually fairly affordable depending on what side of the stadium you are on. One side tends to be fairly intense fans and the other is a little more calm. Do a little research on the team you are visiting before going so you can match up based on your needs. (Especially for families going with young kids). So find the local shop to buy a ticket at, take a short bus ride to the stadium, grab yourself a Peroni and enjoy the game! I hope this helps you decide when to visit Italy. I know it is a little one sided but it is truly a magical time in Italy and you get the full, authentic Italian experience. The owner is such a doll! He truly appreciates your business. Piazza di Santa Croce, 16. (the entrance is hidden on the left side of the church in the back, you will see an entrance with “scuola del cuoio” above the top and music playing, just follow the back of the church and you will find the entrance) This is the place to buy small leather products of the BEST quality, purses, jackets, belts, handmade shoes, etc. Love this? Time to share with friends!